Whole-home generators that provide safe, reliable backup power in the event of an outage. Owners save money with Spence Commercial HVAC & Lennox. Whether you're in business to earn a profit or your organization serves a greater need, spending wisely is one of the most important factors of your success. Spence HVAC can help you keep a strong focus on your bottom line with energy-efficient, high-performance HVAC systems that meet the needs of customers, employees and clients. As much as 50% of a commercial building’s energy is used by its HVAC system*. Focusing on making your system work efficiently can dramatically reduce spending. Lennox has a wide range of ENERGY STAR® systems to reduce energy consumption and minimize maintenance costs. A low total cost of ownership, with a variety of high-efficiency HVAC equipment systems, including Strategos™ and Energence™ rooftop units, and other ENERGY STAR qualified products. Environmentally friendlier solutions with a full line of R-410A equipment. Cut energy bills with optional components including NEMA premium-efficiency blower motors. Reduce time and costs spent on maintenance with easy access designs such as slide-out blower decks and toolless access panels. Simplified troubleshooting with the Integrated Modular Controller (IMC) on all premium rooftop units, and the L Connection® Network which makes it easy to diagnose service issues from a desktop. Signal problems before they begin with products that help avoid system failure and lost productivity. Precise humidity control for split systems with the Humiditrol® dehumidification system. With so many ideas to help improve productivity and profits, it ’s easy to see why businesses choose Lennox. For more information on how Spence HVAC and Lennox® can help you and your business, contact our Commercial Services professional. 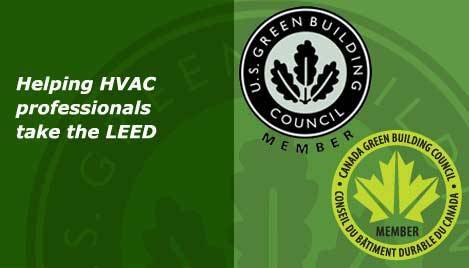 LEED® is a third-party certification program created by the U.S. Green Building Council and the Canadian Green Building Council that encourages the adoption of sustainable green building and development practices. Known officially as the Leadership in Energy and Environmental Design Green Building Rating System™, LEED is recognized as the national benchmark for the design, construction and operation of high performance green buildings. LEED gives building owners and operators the tools they need to have an immediate and measurable impact on their buildings’ performance. LEED promotes a whole-building approach to sustainability by recognizing performance in six key areas of human and environmental health: sustainable sites, water efficiency, energy and atmosphere, materials and resources, indoor environmental quality and innovation in design. Why green building is important. LEED-certified projects cost less to operate and maintain than traditional buildings, are energy- and water-efficient and have higher lease rates than conventional buildings in the same market. * LEED certification, which includes a rigorous third-party commissioning process, offers compelling proof to you, your clients, your peers and the public at large that you've achieved your environmental goals and your building is performing as designed. Getting certified allows you take advantage of a growing number of state and local government incentives, and can help boost press interest in your project. Learn how Spence Commercial HVAC & Lennox can help obtain points toward certification. Copyright © Spence Heating and Air Conditioning Inc. All rights reserved. All information contained herein is deemed accurate and reliable. Subject to change without notice. Developed by - Hound Computer Solutions Inc.